What is the significance of G7 summit for hard working families in the U.S. and around the world? The conclusive answer is absolutely nothing! Would a successful G8 (with Russia) or G6 (without Russia and the U.S.) summit make the lives of ordinary people better? Again the answer is NO. “the rules-based international order is being challenged, not by the usual suspects but by its main architect and guarantor: the United States”. 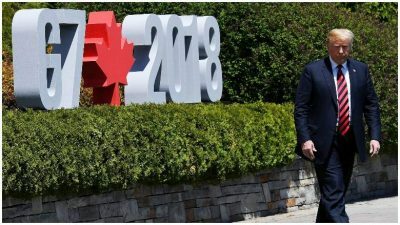 President Trump who ignited a Trade War with his allies left the G7 summit early since he claimed that he was on a “Mission of Peace” with the U.S. long time enemy, North Korea. The 24/7 gossip news networks and their clueless pundits find Mr. Trump’s unorthodox approach toward the G7 summit and American allies, a fascinating TV show. To these “political analysts”, President Trump is either a “Masterful Negotiator” or a “Complete Moron”. The fact is Mr. Trump represents the United States of America who has the support of the 1% and the financial elite; his personality is irrelevant. He is delivering American new policies on Trade and International relationship which are risky and dangerous. These policies are designed to establish an American global hegemony. Today the U.S. is simply asking the sovereign countries to either become subordinate to its rules or face a harsh military retaliation. After World War II, the U.S. as a victor spent some money in Europe and elsewhere to make more money from the global market. Today the U.S. economy is declining; American manufacturers are losing to their foreign competitors. In comparison to other advanced countries, the U.S. looks more like a “third world” country. The ideal of robust production has been diminished by the fictitious financial sectors and Wall Street scam players. Mr. Trump (a con man himself) represents the most corrupt wealthy people in America who want to privatize everything that the public expects from the government. In another words, Mr. Trump wants to feed the hungry billionaires in the very swamp that he promised to drain. In actuality, the Trump administration is looking backward to govern the nation; all the way back to the Feudalism. A time when Aristocrats demanded of their subjects (the peasants) to simply live and die in debt to their Lords, when peasants had no rights or concept of what it was to be free as a human. After 500 days of the new administration we are already witnessing how the Financial Aristocrats have became a major power in Washington and how the Congress is being pushed back, on the verge of becoming obsolete. While the Republican and Democratic parties are chasing each other in circle, a fascistic minded President has been gathering the reactionary billionaires and hawkish military personalities and warmongers to “Make America Great Again” for the 1% in the U.S. Today average Americans are in financial debt that ties their hands to strike and fight back the social and financial injustice. The majority, who are considered as the lucky ones, work hard day in and day out for long hours to pay off the heavy burden of a house mortgage or auto loans throughout their lives. The young people who were able to graduate have to pay their heavy student debt on entry level employment pay (if they are lucky enough to find a job at all). However the daylight robbery of Billionaires who are support and make up the Trump administration has brought out working people and youth in large numbers onto the streets and already has caused a new challenge to the 1% and their politicians. President Trump has unleashed the awesome power of American working people internally and on the global scale he has pushed the friends and foes to form new alliances. “I think within the first minute I’ll know”. Mr. Trump in advance gave Kim Jong Un a “one time shot” chance! The truth is the question of reunification of South and North Korea and the end of hostilities is supported by the people of both countries and already has progressed. It is not up to President Trump to decide the future of the Korean Peninsula. There are many other factors involved that indirectly shapes the U.S./N.K. summit. China naturally is very concerned about the outcome of summits in Canada and Singapore. 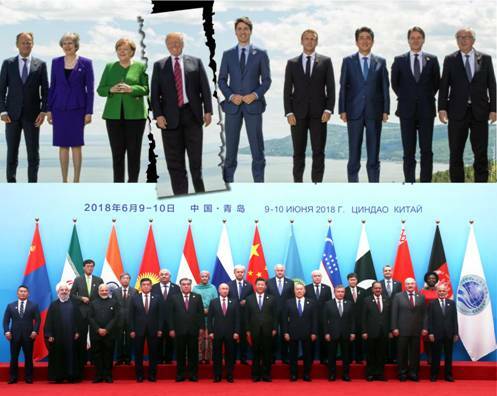 In parallel and contrast to the G7 summit, China hosted the Shanghai Cooperation Organization (SCO) annual summit to show ‘unity’ among its members (China, Russia, India, Pakistan, Kazakhstan, Uzbekistan, Kyrgyzstan and Tajikistan with Iran as an observer and was represented by the Iranian President Hassan Rouhani). Regardless of the drama that President Trump plays every few minutes, he is not the sole decider and does not have the last word on any national or international issues. In fact the backlash to the U.S. new policies will be severe and unprecedented. For his credulous base, Mr. Trump has created an imaginary world that turns only by his command. The U.S. government through Mr. Trump presidency dangerously has moved the world closer toward a fatal nuclear war. Peace activists and democratic minded people around the world must rise and stand up against Tyranny and War before the first nuclear missile is launched.